The review contributed to IAA PortNews by Informall BG covers only loaded containers – 1,084,213 TEUs which is up 9.25% as compared with the first half of 2017. The growth of container throughput was shown by all countries of the Black Sea region with the highest growth registered in Ukraine, Georgia and Bulgaria – 17.32%, 14.66% and 6.05% accordingly. Imports account for 56.58% of containers handled in the region in the first quarter of 2018, exports – 43.42%. Loaded/empty containers ratio in the region is 73.61% / 26.39%. As compared with HI’17, exports of loaded containers in the Black Sea region climbed by 3.11%. Ukraine showed the steepest growth - 16.89%. The growth was demonstrated by all countries except for Georgia (-15.25%) and Romania (-6.21%): in Russia and Bulgaria it was 3.25% and 1.63% accordingly. As for imports into the region, it grew by 14.48% mostly due to increased imports to Georgia, Ukraine and Romania (up by 21.13%, 17.75% and 17.31%). Bulgaria and Russia showed the following growth of imports – 9.23% and 8.29% accordingly. Georgia demonstrated a record high growth of imports – by 21.13%. Handling of loaded containers in the reported period per country is as follows: Ukraine – 29.65%, Russia – 27.90%, Romania – 22.56%, Georgia – 11.37%, Bulgaria – 8.52%. 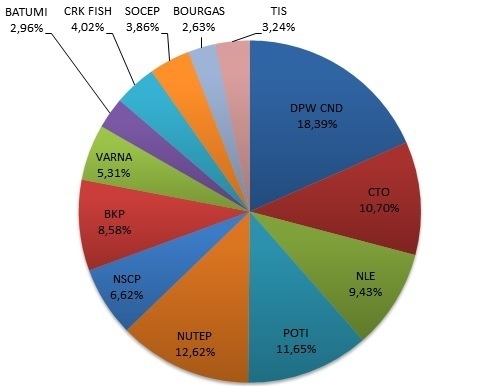 In the first half of 2018, the list of top five container terminals remained almost the same with DPW (Constanta) having retained its leading position, HPC Ukraine (Odessa) having come down to the 4th position and APMT Poti (Georgia) having climbed up to the 3rd position. NUTEP (Russia) and Novoroslesexport (Russia) have retained their positions (the 2nd and the 5th accordingly). 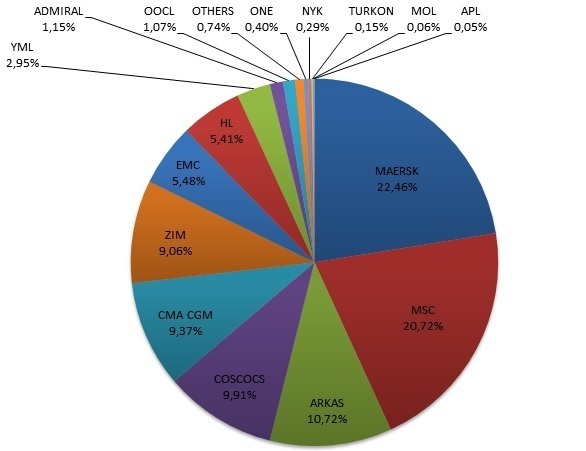 All the top five terminals of the region demonstrated the growth of container throughput. As for operators of Black Sea lines, the list of leaders has remained almost the same. It includes Maersk Line, MSC, ARKAS, COSCO and CMA CGM with COSCO having pushed CMA CGM down from the 4th to the 5th position and Maersk Line having retained its leadership. The above lines control 73.19% of the market. In H1’17 the total market share of Maersk and MSC was 45.42%, but in H1’18 it decreased by 2.24 p.p. to 43.18%. COSCOCS showed a considerable growth of its market share from 8.40% in H1’17 to 1.51 п.п. и 9.91% in H1’18 (up 1.51 p.p. ), that allowed COSCOCS become the fourth largest carrier in the Black Sea region. It is also worth to note that in H1’18 against H1’17 CMA CGM gained 0.12 p.p. of market share. ARKAS lost 0.29 p.p. but remained the third largest carrier in the Black Sea region.